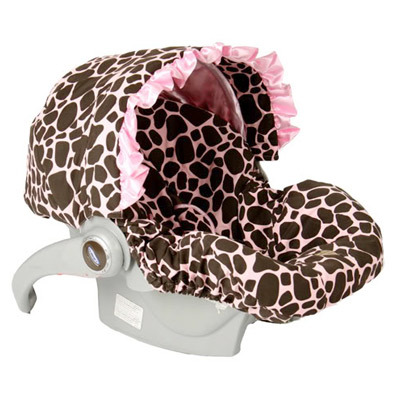 A hip giraffe print in brown and pink, this Baby Bella Maya cover offers parents a stylish look for an infant car seat with a unique safety benefit: snaps. Not found on other brands, these snaps allow the cover to be easily removed, washed and securely placed back on the car seat without the danger and hassle of repeatedly removing its straps. Simply slide straps through the inserts, snap it up and you are ready to go. No wonder it won the seal of approval from The Baby Planners! A ruffled canopy cover and matching seatbelt pads finish the look. Made of woven polyester blends. We recommend hand washing in cool water, lay flat to dry. Covers may also be machine washed on delicate cycle, set dryer on cool with no heat. Fits Most Major Brands including Graco, Britax, and Peg Perego.